Is it just me? Can you feel it? A change in the air? Maybe it’s simply the faintest scent of fall, carried in on the delta breezes during late August. Maybe it’s hard wiring, an internal system of checks and balances that keeps us in tune with nature’s cycles. Whatever it is, something’s shifting. At least for me. Yes, things are changing. But for now, I’m putting that on the back burner. And heading out to enjoy these final days of summer. I’ll be at the Sonoma Coast for a week. Walking the Kortum trail. Hanging out at Cafe Aquatica. Visiting the Grove of the Old Trees. No kidding, I’ve been meaning to visit the trees for more than a year, so it’s way past time. Plus, I have a thing about redwood trees. I’ll never forget the moment, over a decade ago, when a campground host in Richardson Grove State Park looked me straight in the eye and said, “You know, a redwood will heal itself.” In that instant, we both connected to something large and mysterious. Yes, there will be that. Me emptying out, and connecting to something large and mysterious. But there’s going to be some beach strolling and sitting too. And then, when I’m all emptied out, I’ll fill myself up again on a date with Manet, Degas, Monet, Renoir. Oh, those Impressionists! My heart’s already a-flutter. And finally, back home. To spend summer’s waning days watching the peculiar slant of the sun, as it makes its way across the lawn, starting its wind-down in preparation for the shorter days of fall. I’ll be gone from my cozy blogging nest for a few weeks, returning on Thursday, September 9th. When I get back, I’ll tell you all about my recent adventures in keeping a time journal, and fill you in on the changes I’ve hinted at here. But my door will stay open when I’m away. So come on in and take a load off. As a matter of fact, I’ve ransacked the archives, just for you, and snatched up a few posts you might enjoy that you likely haven’t seen. I know this, because I wrote them back when there were maybe ten people visiting each week. So if the spirit moves you, click over. And if you feel so inclined, please tell me: Do you feel a change in the air, or is it just me? I welcome referrals to my blog and counseling/coaching services. If you know someone who may be interested in what I write about or what I do, please share with them. Your satisfaction and trust in my services means a lot. Thank you. I don’t feel a change in the air, yet. But funny you should ask; I’ve been thinking about the fact that it is August and summer is almost over. Trying to connect with the melancholy of a favourite season ending and I can’t. So weird. Anyway, hope you enjoy your break. Your plans sound wonderful. If there’s a dhift, it is coming only very slowly. August is my least favorite month, I can’t wait to see it go. Hi Patty! I sure DO feel a shift – for one thing it got cooler at the lake and the bears are out more. Since this is NOT my favorite thing (the bears) I am home now. It’s the wind-up time anyway, do the last of the warm weather activities to be enjoyed and start planning for winter. I think I’m in pre-harvest or something. Enjoy your time away! Can’t wait to hear about it! Sonoma Coast sounds really cool. Jimmy and I did the lower PCH drive. We want to come back and go north. I checked out the Grove of the Old Trees link as I’m a fellow tree lover. Some folks near me buzzed down a good-sized gorgeous cherry tree in front of their home. Drop dead beautiful tree. I stopped to touch it every spring when it blossomed. Painful to walk by and see the bare spot where the tree used to thrive and brighten up the neighborhood. People around me have taken down healthy trees because their leaves cluttered up the yard. I loved bouncing around in piles of leaves as a kid. Will read your earlier blog posts. Relate to the need for them to see the light of day again. I, too, wrote some good stuff when few were watching. Good idea to bring them back to life. The season shift here doesn’t happen until October. That’s when we get our first whiff of fall. There is change coming though. I’m finding changes in my own life, awakenings to new things, and new fun in the blogging world. The last year and a half have brought many changes for me and my life, and I see a bright future of change ahead. I feel the shift, Patty, and I welcome it. I’d love to hear more about what the shift has been for you. I envy you and I hope you a wonderful break…tell the Redwoods hello for me. I’ve never actually met one…but as I love all trees, I’m sure we get along fine. I guess you can’t hug a redwood can you? There a bit big for a hug, but I love the idea that they can heal themselves. We’re just starting to feel the change in the air and the light here in Portland and I love it because fall is my favorite season. But also because this has been a momentous summer for me, with both my children getting married. Now, all of a sudden I feel a newfound sense of freedom. Talk about things shifting…it is wonderful! Also, thanks for leaving a few star-studded links for us. I’m delighted to check them out. Thank you! I wish you well as you replenish on the Sonoma Coast. What beauty there, I can see you there and imagine you’re loving it. Of course, you know I’m a summer girl, but I’m getting better at enjoying life regardless of the season. In the UK we are moving towards Autumn (fall) at full throttle. Can’t believe how fast the summer has gone, guess I’ve been so busy that it has drifted past without me noticing. No problem… I love Autumn. A time to see some spectacular colour changes. Change is coming for sure. I can feel it. Enjoy the redwoods. I love the photo at the top and can’t wait to hear all about your adventures. I finally saw redwoods for the first time in Muir Park a few years ago. Breathtaking! Yes in AZ the tempature is cooler in the AM. Today I ran for the first time in about 8 weeks. And it felt so good. My heats a fluttering with yours as we come into fall. That is a remarkable thing when we stop to think about it, isn’t it — that a redwood, or for that matter a human being, heals itself. How, I wonder, can we seriously deny that the universe has its own intelligence and purpose, and claim that everything’s just chaos and chance, when we’re confronted with this? Wow, happy journey to you! 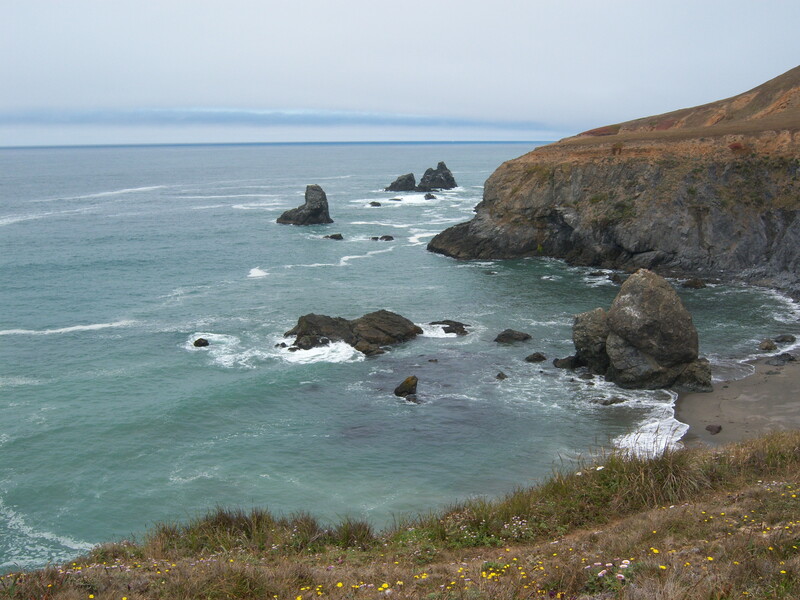 I LOVE the northern coastline of Ca. It is a favorite of mine to travel all the way up the coast. I, too, have had spiritual experiences standing amidst the redwoods. They have a remarkable energy. I feel renewed and awed when in their presence. I love hearing they can heal themselves. Yes, I sense the change in the air and am spending every moment I can at the beach boogie boarding and hanging to soak it all in – summer, my favorite time. Your post is a reminder of transitions in general – life is transition. Each day I want to remember to soak in the moment. May you have a fantastic trip and thanks for showing us tidbits – the links are great! Yes – there is a change in the air – but then I have a kid who starts school in September so… things are changing and it isn’t just in the air! Oh, and I turn 40 in just a few days… change, change, and more change! I’m jealous that you’ll be near the ocean…I didn’t get to make my last-ditch trip to the coast this year with the kids in tow…hopefully the weather will remain nice and we’ll be able to make the trip the first weekend of October.